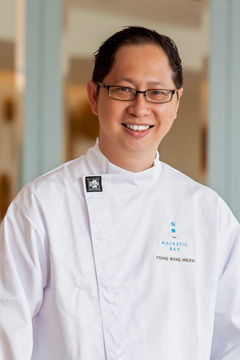 Formerly the Executive Chinese Chef at the Hai Tien Lo restaurant in Pan Pacific Hotel Singapore and Chef De Cuisine of the Raffles Hotel Singapore for the Empress Room and Doc Cheng’s, Chef Yong Bing Ngen was also the Executive Chef for Jade restaurant in Fullerton Hotel. With 29 years of experience under his belt, Chef Yong believes that a good Chinese chef should have a strong basic foundation of Chinese cooking skills and also be continuously exposed to the different ingredients and produce available in the market. Harmoniously introducing new ingredients which he discovers into his menu is his guiding culinary philosophy. Chef Yong aims to continue to innovate and push culinary boundaries while keeping true to the roots of Chinese cooking.